The St Mary Magdalene Chapel, Chichester Cathedral, with Graham Sutherland’s ‘Noli me tangere’. 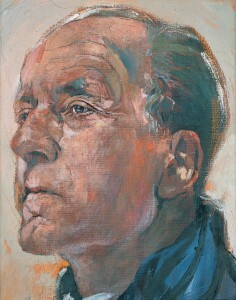 Graham Sutherland – ‘Portrait of Walter Hussey’, begun 1965, oil on canvas, Pallant House Gallery (Hussey Bequest, Chichester District Council, 1985). It has often been the role of enlightened patrons to enable artists to express their visions. In 1942, as bombs fell upon Britain, Walter Hussey, on Kenneth Clark’s recommendation, commissioned Henry Moore to carve ‘Madonna and Child’ in the warm hues of Hornton stone at St. Matthew’s, Northampton, where he was vicar. 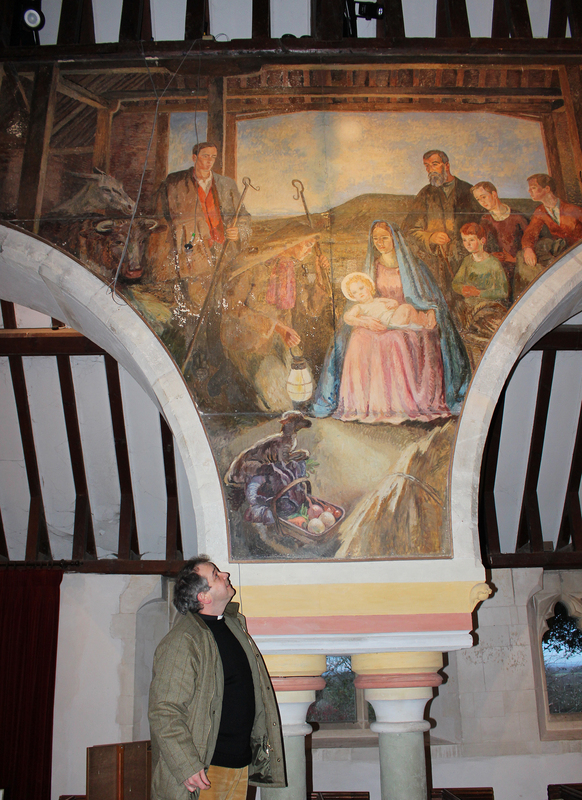 As the sculpture was nearing completion, Hussey talked to Moore about a number of artists he was considering for a large painting in the south transept, opposite ‘Madonna and Child’. Henry Moore unhesitatingly recommended Graham Sutherland. In 1955, Winston Churchill’s last ecclesiastical appointment was to install Walter Hussey as Dean of Chichester Cathedral, where his influence bore much fruit. Hussey can be credited with commissioning most of the exemplary 20th century art at Chichester Cathedral. How appropriate, then, that Walter Hussey’s gift of much of his art collection to Chichester should reside at Pallant House Gallery. 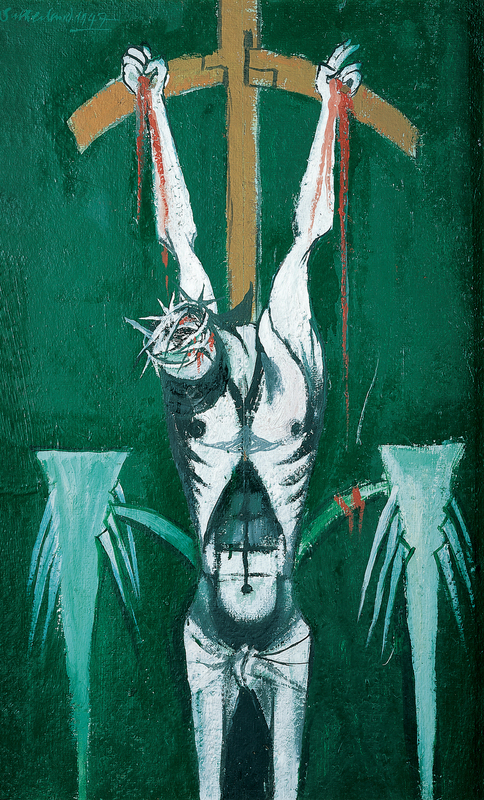 Sutherland’s 1947 version of the ‘Crucifixion’ from the Hussey Bequest is displayed at Pallant House Gallery. It illustrates the artist’s obsession with thorns as metaphors for human cruelty; their jagged lines are reflected throughout the composition. The American military published a book of photographs which featured scenes of the Nazi concentration camps, including images of those held captive at Belsen, Auschwitz and Buchenwald. To Sutherland, “many of the tortured bodies looked like figures deposed from crosses” and he acknowledged the influence of these photographs on his Crucifixions. Here, Jesus Christ’s body hangs lifeless upon the cross, the shocking red of his blood accentuated by the fertile green. There is agony in the body’s posture, the weight clearly visible in the angular shoulders, chest and distorted stomach. This is a God who understands and shares in human suffering. Graham Sutherland, a Roman Catholic, was sustained by his Christian faith all his life. He commented that he was drawn to the subject of the Crucifixion because of its duality. He noted that the Crucifixion “is the most tragic of all themes yet inherent in it is the promise of salvation”. In Sutherland’s versions, a generation united in their common story finally had depictions of the Crucifixion which reflected their experience of the world and yet spoke loudly of the triumph of hope in response to the tragedy of violence and war. 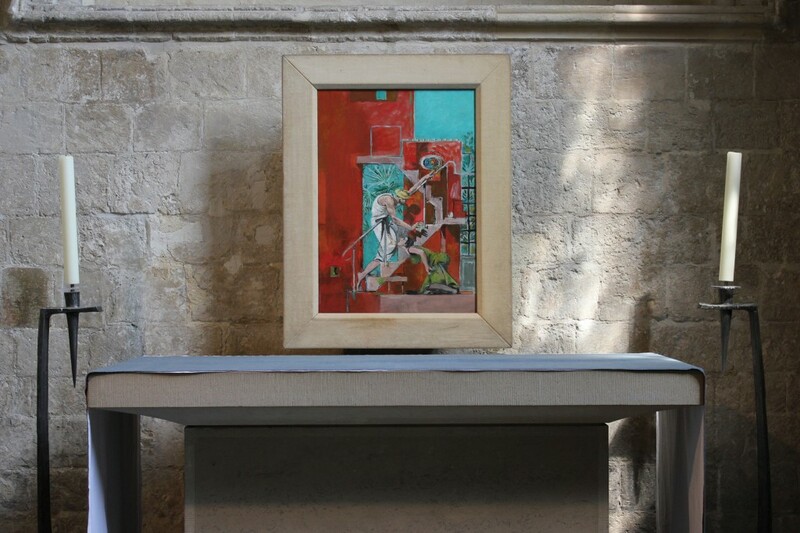 Graham Sutherland’s vibrant oil on canvas ‘Noli me tangere’ of 1961 was commissioned by Walter Hussey for the St Mary Magdalene Chapel in Chichester Cathedral. The painting depicts the moment on that first Easter morning when Mary Magdalene becomes aware that she is in the presence of her risen Lord who has just spoken her name. As she reaches out to touch him his gesture stops her. The angular composition of the figures, plants and staircase allude to the Passion narratives which lead up to and include Jesus’ crucifixion. At the centre of the painting is Jesus Christ dressed in white symbolising his holiness and purity. Christ’s finger points towards God the Father symbolising His presence. Graham Sutherland invites us into the narrative at this liminal moment so that we, like Mary, might acknowledge Jesus, our creator, teacher and friend, as advocate and redeemer of the whole world. Here we witness the triumph of hope and love over evil and hatred. There are a number of special services and concerts at Chichester Cathedral in the coming days to mark Holy Week and Easter. For more information and times go to www.chichestercathedral.org.uk. To find out more about Pallant House Gallery, 9 North Pallant, Chichester, PO19 1TJ, its collections, exhibitions and opening times go to www.pallant.org.uk or telephone 01243 774557. By Revd. Rupert Toovey. Originally published on 1st April 2015 in the West Sussex Gazette. 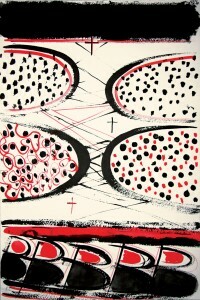 A dramatic exhibition of Terry Frost’s prints from his Lorca Suite is currently on show in the De’Longhi Print Room at Pallant House Gallery in Chichester, West Sussex. 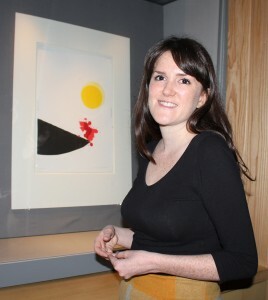 It focuses on the British abstract artist Terry Frost and his engagement with the poetry of the Spanish poet, playwright and theatre director Federico García Lorca. Lorca became one of the first martyrs of the Republican cause in the Spanish Civil War when he was killed by fascist Nationalist rebels in 1936. 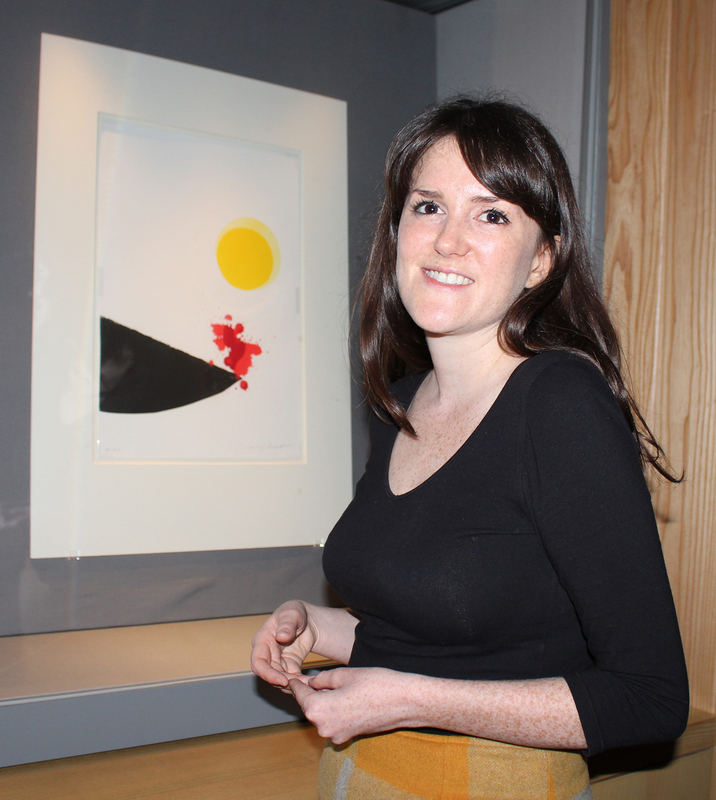 Assistant Curator Katy Norris explains, “Lorca’s death has come to epitomise the violent suppression of the intellectual left by right-wing partisans.” When General Franco seized power in 1939, at the end of the conflict, he banned Lorca’s work from publication in Spain. 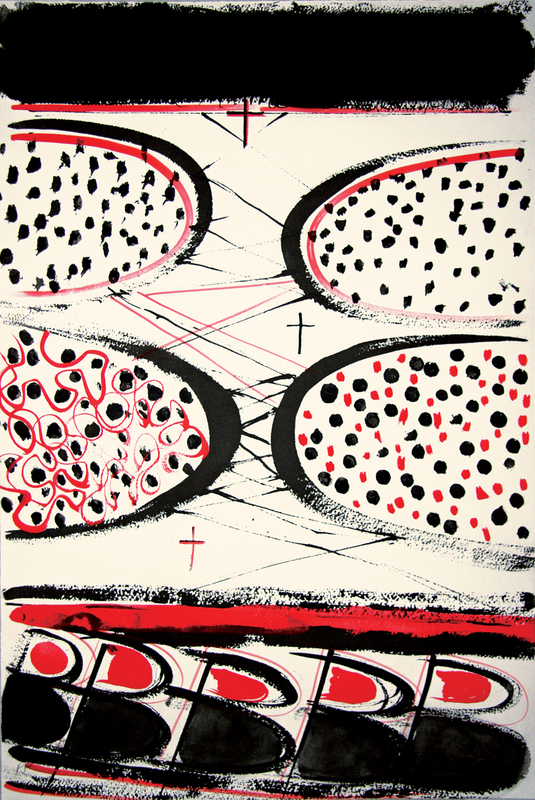 The liberal society in which Terry Frost was working in the 1970s and 1980s was certainly in complete contrast to Franco’s earlier repressive regime. 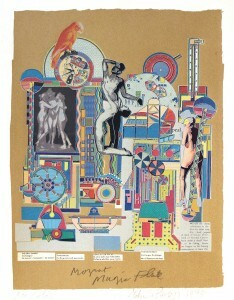 Frost would return to Lorca’s work over a fifteen-year period, creating paper collages, drawings and prints in response to the writer’s work. It culminated in the portfolio of coloured etchings on display here. Produced in 1989 and titled Eleven Poems by Federico García Lorca, they have become known as the Lorca Suite. Together these images, each based on a specific poem, provide a visual window illuminating Lorca’s writing. Lorca’s writing employs an economy of vocabulary. In these poems life is stripped back, allowing clarity of vision expressive of the author’s heightened perception. This writing is filled with ambiguity and a lack of fulfilment, which gifts it with space and nobility. This distance between the artistic representation and the reality of the subject would give Frost space for freedom of expression. 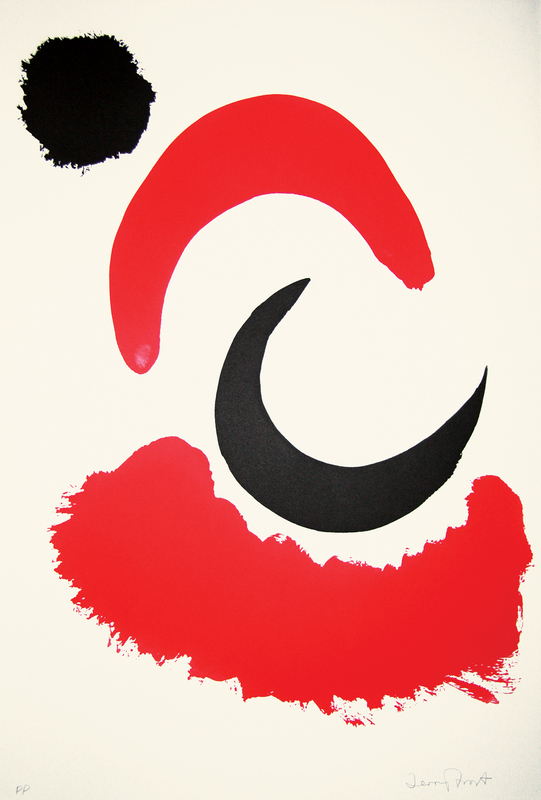 Terry Frost, like Lorca, also distilled the world around him. He, too, used a carefully conceived vocabulary, though Frost’s was one of colour, light and form in the abstract. “Oh white wall of Spain! Oh black bull of sorrow! The drama and tragedy of the Spanish Civil War and the life and death of Lorca are captured with real intensity in Terry Frost: Eleven Poems by Federico García Lorca. 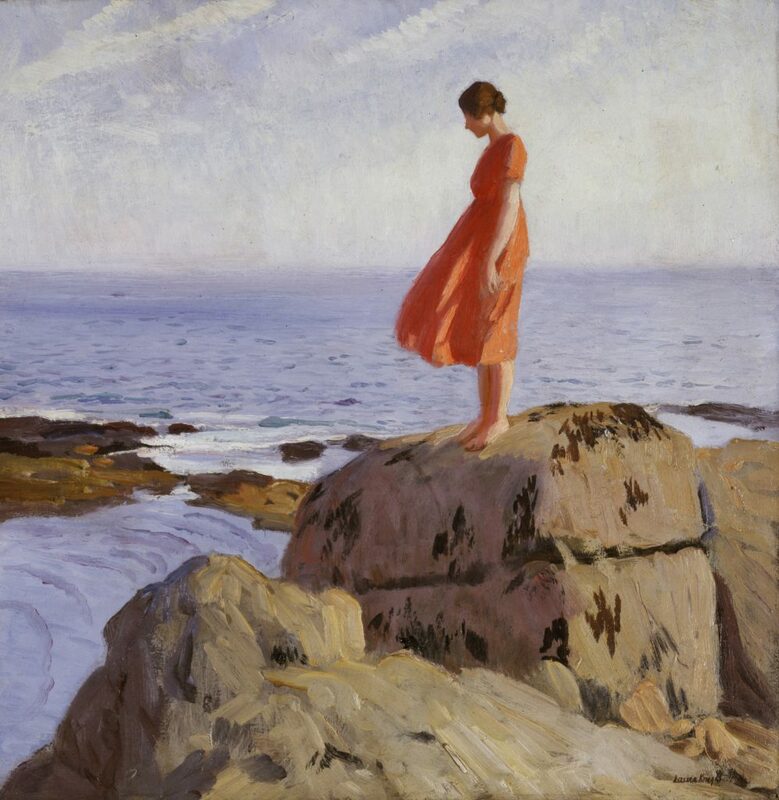 Entrance to this exhibition is free but it is worth treating yourself to tickets for Conscience and Conflict: British Artists and the Spanish Civil War. 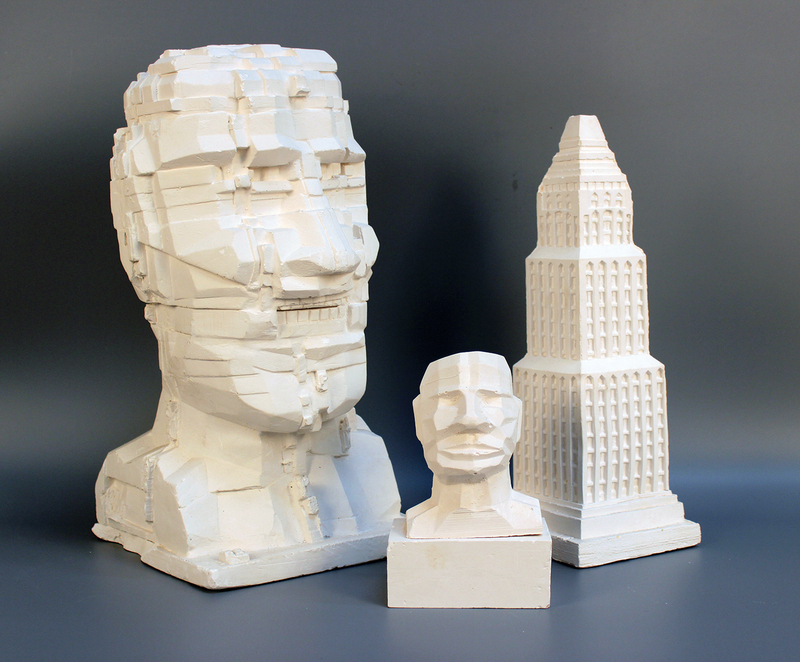 Both exhibitions run until 15th February 2015 at Pallant House Gallery, 9 North Pallant, Chichester, PO19 1TJ. For more information go to www.pallant.org.uk or telephone 01243 774557. You must add them to your 2015 New Year’s must-see list! By Revd. Rupert Toovey. Originally published on 28th December 2014 in the West Sussex Gazette. With Christmas approaching, I have come to see the remarkable painted interior at St Michael and All Angels church at Berwick in East Sussex. I want to reflect once again upon Vanessa Bell’s beautiful depiction of the Nativity. The fine decorative scheme was commissioned by Bishop George Bell of Chichester. Bell was a great patron of the arts. He wished to see churches once more filled with colour and beauty. Eternal truths would be proclaimed anew in modern art, poetry and music. More people would be drawn into the Christian community by the revival of this old alliance and renewed vitality. 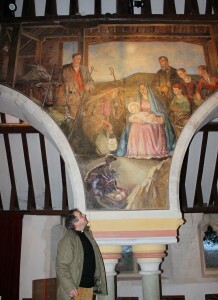 Bell founded the Sussex Churches Art Council. 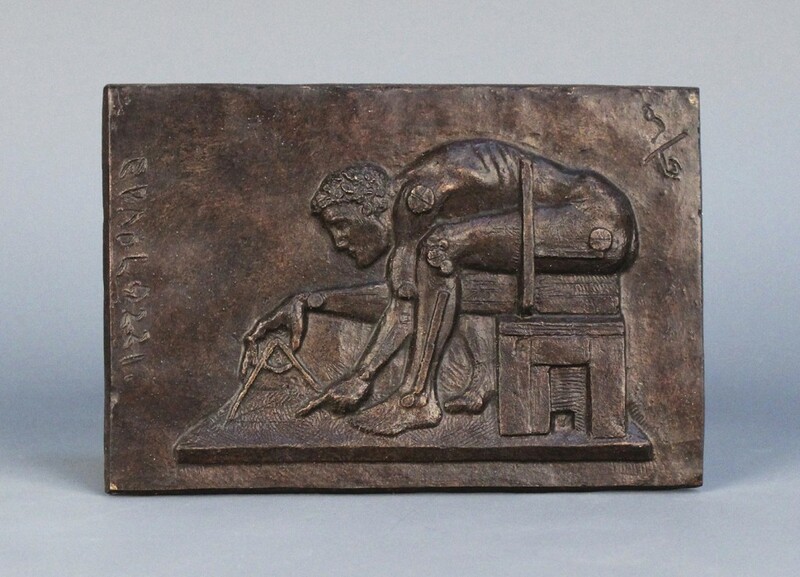 Relying on generous patrons, like the famous economist John Maynard Keynes, he began to commission work. 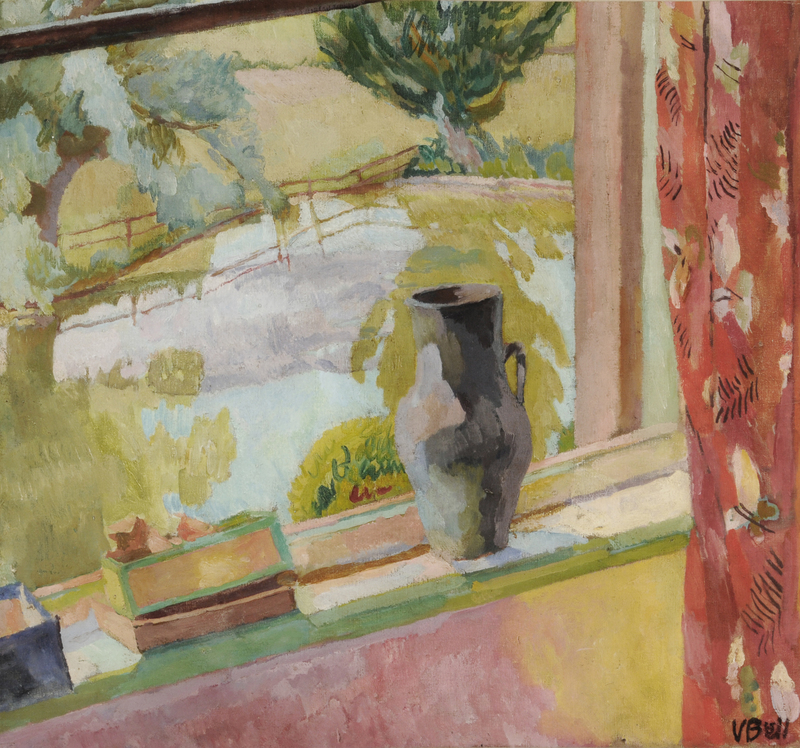 Keynes was a frequent visitor to Charleston, where Duncan Grant had a great influence on his artistic sensibilities. Visitors to the Bishop’s Palace in Chichester included Gustav Holst, Vaughan Williams, Vanessa Bell, Duncan Grant and T.S. Eliot. During the summer and autumn of 1940 the Battle of Britain was fought over the skies of Sussex. The Luftwaffe failed to defeat the R.A.F. but the Germans continued the Blitz into the May of 1941. 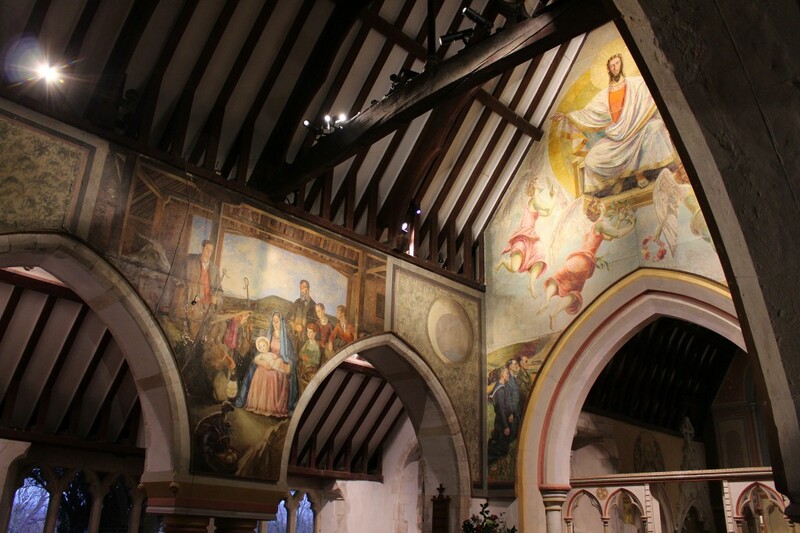 Against this backdrop, Bishop Bell commissioned Duncan Grant and Vanessa Bell to paint St Michael and All Angels. The parish church at Berwick is just a few miles from the artists’ home at Charleston. Writing to Angelica Bell in 1941, Vanessa Bell proclaimed that Charleston was “all a-dither with Christianity”. Large panels were prepared to be painted on in the barn at Charleston. Family, friends and neighbours were used as models. Initially the project met with local opposition but Kenneth Clark and Frederick Etchells acted as expert witnesses and the scheme was accepted. At the time Kenneth Clark was director of the National Gallery in London and Surveyor of the King’s Pictures. The visitor today is met with a scheme of paintings in the Renaissance style. They depict scenes from the New Testament, which include the Annunciation, Christ Crucified and Christ in Majesty. Vanessa Bell’s Nativity sets the familiar Christmas story of the birth of Christ in the folds of the Sussex Downs. The scene is painted in a barn beneath the Firle Beacon. Local shepherds posed for the panel. Their distinctive shepherds’ crooks are typical of those made at Pyecombe since medieval times. Vanessa’s daughter, Angelica, is depicted as Mary. St Luke writes: “Mary treasured all these things and pondered them in her heart.” Here Mary looks on, preoccupied with her thoughts. Many people have suggested that the baby Jesus is reminiscent of Vanessa’s son Quentin, but I have often wondered if she was thinking of her older son, Julian. Julian Bell, a poet, had been killed in the Spanish Civil War. Peter Durrant, a local farm worker, is painted as Joseph. He lost his left arm as the result of an accident in which he fell from a wagon. To his right are three children, who worship at the crib in their school uniforms. They are Ray and Bill West, sons of the Charleston gardener, and John Higgens, son of Grace, the housekeeper. The stable is lit by a lamp at the foot of the composition. The lamb below is a symbol for Jesus, the Lamb of God, who takes away the sins of the world. Berwick’s Nativity brings to life this timeless, much-loved and familiar story, placing it in the heart of Sussex. It also remembers the joys and sorrows, and the hopes and fears of this community of people. Like the first Christmas, the season remains a time of gathering, reflection and remembrance. A time of shared memories and stories. The Rector, the Revd. Peter Blee, will be celebrating a candlelit Midnight Mass, which starts at 11.30pm on Christmas Eve, and a Family Holy Communion at 11.00am on Christmas Day. St Michael and All Angels is one of my favourite places to stop and pray when I am in the east of our county. My thanks go to the Revd. Peter Blee and his congregation, who make this a living, prayerful place of pilgrimage for us all. I wish you all a very happy and blessed Christmas! By Revd. Rupert Toovey. Originally published on 24th December 2014 in the West Sussex Gazette.